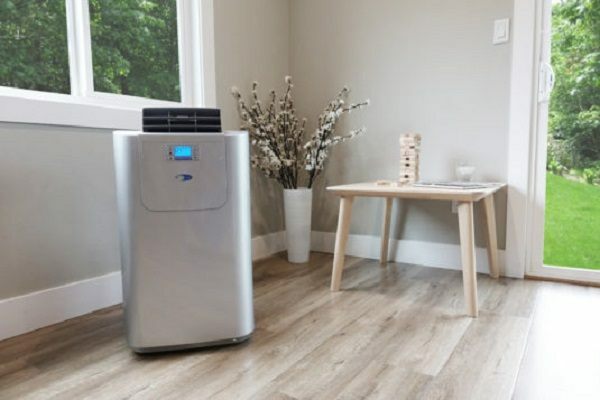 Are you looking for a portable air conditioner that can cool a medium-to-large room in your home? 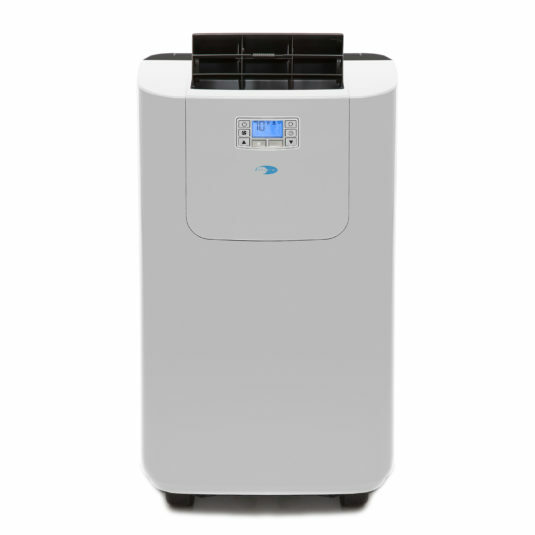 The Whynter Elite ARC-122DHP Portable Air Conditioner is designed to work in rooms of up to 400 square feet. Its high BTU rating and dual-hose design boost its performance, allowing it to cool a large area while maintaining high energy efficiency. The Whynter Elite's compact design means you can place it just about anywhere near a window. When you are not using it, it can easily fit into a storage closet. In addition to cooling and dehumidifying a room, the Whynter Elite ARC-122DHP can also heat it. 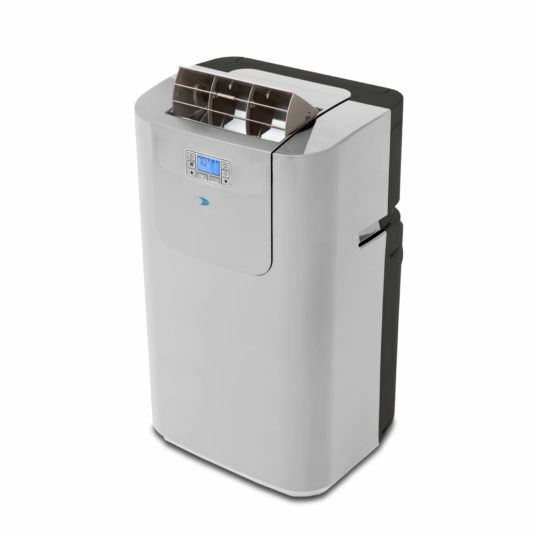 Keep reading to see our full Whynter portable air conditioner review, below. Heating, cooling, fan and dehumidify modes. Performs really well in cooling and OK in heating. The window kit takes time to install. It’s not silent - about the same noise as a fridge. The ARC-122DHP packs a lot of power in its compact size. With 12,000 BTUs, the unit can easily cool a large room (max 400 square feet) without leaving any unattended hot spots. It is one of the most powerful midrange portable air conditioners you can buy. You can use this unit in a living room, bedroom, home office or family room. You can also set it up in the basement, as long as there is a window where you can fit the exhaust kit. Other ideal locations to set it up to include the garage, workshop and server room. If you want to cool a room larger than 400 square feet, you can still use the ARC-122DHP portable AC but it may struggle and will not be as energy efficient. For larger rooms, we recommend the Whynter ARC-14SH 14,000 BTU Portable Air Conditioner, which can cover a room as large as 500 square feet (20x25). If your room is small (less than 200 square feet), then the ARC-122DHP AC is definitely not the right choice. Try something smaller, like the L﻿﻿﻿﻿G ﻿﻿﻿﻿8,000 BTU Portable Air Conditioner﻿﻿﻿﻿﻿. Learn about all of the best portable ACs in our recently-updated ﻿buying guide. Using the control panel at the front of the unit, you can choose from four different comfort modes. Cool – this is the standard cooling mode. The unit takes warm air from the room and replaces it with cooler air from the outside. Heat – thanks to a built-in heat pump, the unit can also blow warm air into the room. So even when the weather gets chilly, you can continue using it. 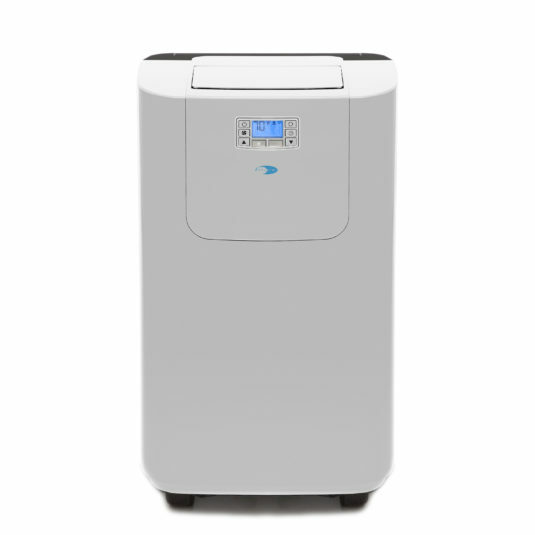 Dehumidify – like most portable air conditioners; the Whynter Elite ARC-122DHP also acts as a dehumidifier. It takes water from the air in the room and either evaporates it through the exhaust vent or drains it through a drain tube. Fan – In this mode, it acts like any other fan. It is ideal when you just need some moderate cooling. 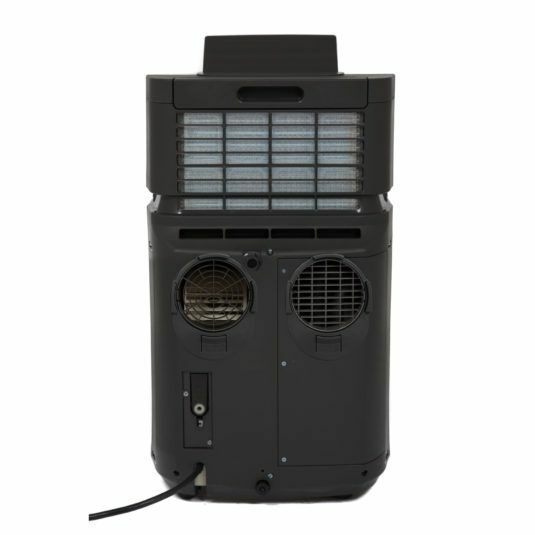 At around 60 pounds, the Elite ARC-122DHP AC is not the lightest portable AC in the market. But it is still very portable. Unless you are planning to go up or down the stairs – in which case you’ll need some help lifting it – you can easily roll it from room to room using the attached casters. The ease of portability also makes it more versatile. Unlike a traditional AC, you can shift it from one room to another without having to do any installations or complicated setups. You can even decide to use the unit in different rooms at different times of the day depending on your family’s needs. One downside to note is that the casters are plastic. So they could mar your flooring and may not last for very long especially if you move the unit around a lot. The Elite ARC-122DHP is incredibly easy to use. The most time-consuming part is the setup, specifically the process of installing the window kit. But once that is done, operating the unit is a breeze. The control panel consists of a small LCD screen and a series of buttons surrounding it. 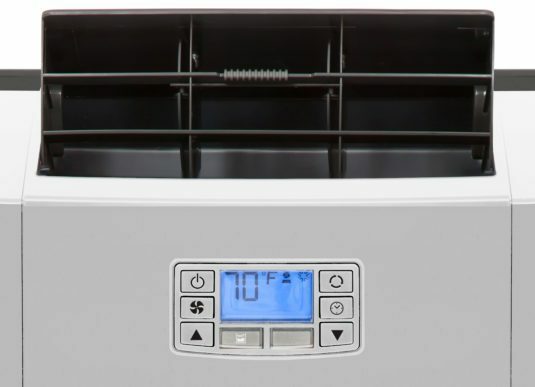 On the right, the power button switches the unit on and off, the fan speed button switches between different fan speeds and the arrow buttons control the timer and temperature level. On the left side, a mode control button cycles among the four modes, a timer buttons allows you to set the unit on an auto-timer, and the downwards arrow button controls the timer and temperature level. Below the control panel is a ‘water full’ warning light. But you don’t have to keep pressing all these buttons. The unit comes with a handy remote that you can use to set the preferred comfort level without having to walk over to where the AC is. 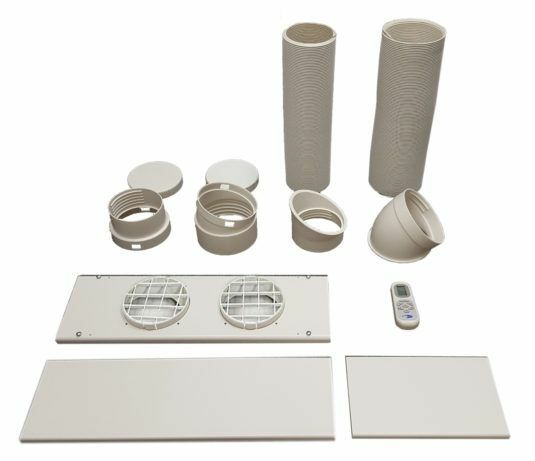 For places with little to moderate humidity, the Elite ARC-122DHP does not need a water drain. It exhausts collected moisture outside. This is what the manufacturer calls Auto drain. However, if there a lot of moisture in the air, you’ll need to use the provided tube to drain the condensed water. The alert light on the control panel will go on when there is water that needs draining. Most owner-reviewers of the Whynter portable air conditioner say that installing ﻿﻿the window kit is the most difficult part of the process. You’ll most likely need to do some cutting to get it to fit perfectly in your window. With a noise level of around 52 decibels, this AC makes a moderate amount of noise, about the same as a modern refrigerator. If you are using this unit in a bedroom or office, then you will hear it but it won't be annoying. The added heater function is one of the best features of the Whynter Elite ARC-122DHP Portable Air Conditioner. We also love the 3-speed fan, the fact that there are two drainage options and the high-performance dehumidifier. If you want a powerful, compact portable AC-heater combo unit, then you can't go wrong with the Whynter Elite.